Did you know that almost 25% of the population collect some form of antique or collectible. And according to the British Antique Dealers Association there are around 20,000 antique dealers & local antique auctions operating in the UK. And more than 100,000 auction houses worldwide. However, knowing that fact won’t help you find your local auction house or help you locate one that holds regular antique and collectible sales. To do that you need a big phone book, local ads or the time to scour maps or business directories. Which is why we thought a unique, easy to use Antique Auctions Finder might come in handy. Whether you’re looking to buying, sell or collect antiques, getting to know your local antique auctions house is a must do. And not just what they sell or where the auction rooms are, but also when they do it and how to contact them. With a one-click function that takes you straight to the auctioneers website; a map locator function that provides the nearest auction rooms to you; the ability to use Google’s street view to take a look around; and the ability to print directions. Our Antique Auctions Finder is exactly the help you need. To find auctioneers simply enter a location and select a category in the menus below then click the FIND AUCTIONS button. 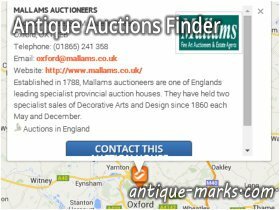 Updates … And yes; the entire Antique Marks team are committed to updating and improving the antique auctions finder. So more and more auction rooms will be included as time allows.